Motability are a service provider of modified cars and vehicles for use by disabled persons. 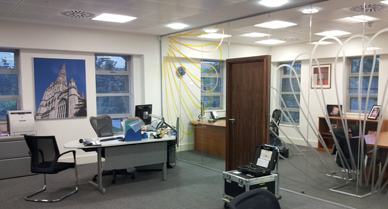 This particular project covered the refurbishment of 4 of their existing offices in Bristol and London. We were initially asked to advise on the reverberation aspects of changing the open plan office ceiling in the Bristol office. This expanded to a full BREEAM acoustic assessment, including office privacy, background noise levels and atmospheric noise emission. Conducted internal and external acoustic commissioning tests to demonstrate compliance with the required British Council of Offices and BREEAM standards. The fit outs needed to accommodate a range of uses including open plan offices for high telephone use staff, associated training and support areas including a café, an executive floor, and other meeting rooms. Noise from the mechanical ventilation system. An environmental noise survey to establish existing ambient noise levels for the purposes of BREEAM and planning requirements. At the same time, we also inspected the buildings to identify potential points of weakness, particularly for partition locations. The results of our surveys informed our review of the proposed bold, modern design and our recommendations for modifications that would both improve the acoustic conditions of each office building, as well as adhere to the British Council of Offices' Guide to Fit Out and Guide to Specification guidelines. Use of an acoustic vertical slat ceiling in the café and reception areas to reduce noise build up and provide a relaxing environment for rest and recovery away from work. Ceilings, partition systems, doors and associated interfaces were all important in achieving the desired acoustic performance. So too was minimising the noise from the air conditioning system and outside traffic for BREEAM purposes. 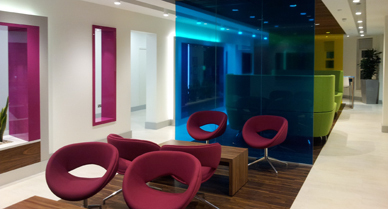 This project won the British Council of Offices 2014 Fit Out of Workplace Regional Award for South West, Thames Valley & South Wales.